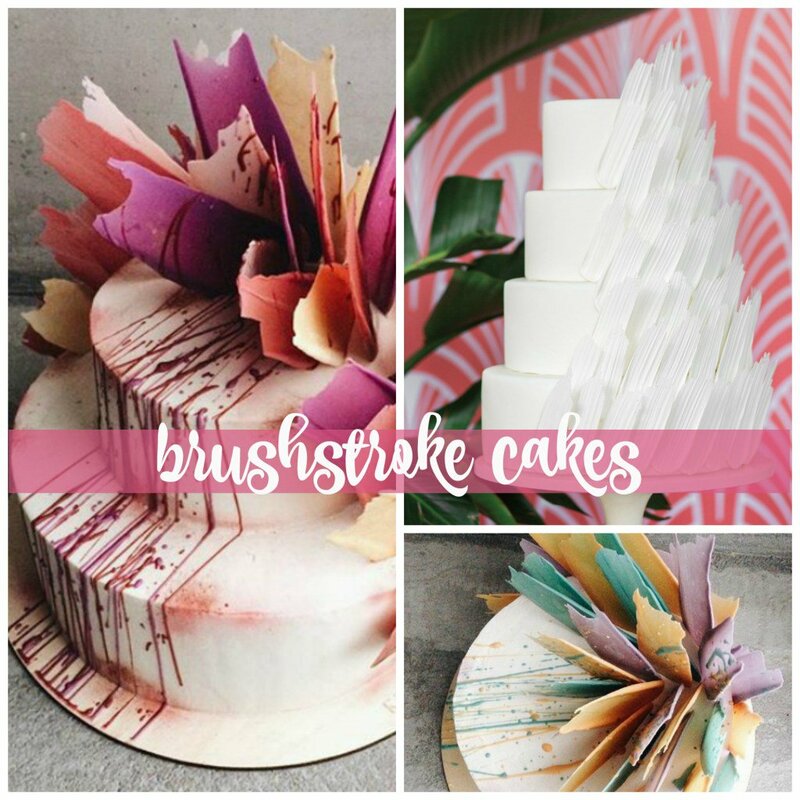 We are love, love, loving the amazing trend of baked masterpieces known as BrushStroke Cakes. Popularized and invented by Kalabasa bakery in Russia, these unique creations are cakes daringly decorated with colorful painted chocolate brush strokes. And boy, oh boy, are they gorgeous! Just take a peak at Kalabasa’s inspirational Instagram feed to see what we mean. The whole process seems relatively simple (although we are PRETTY sure it requires some very serious confectionary skills)….the cake artists just melt chocolate until it’s spreadable, then use a pastry brush to swipe it onto parchment paper. After the swaths of chocolate harden up, they are delicately added to cake tiers. The beautiful brush strokes can be painted any color, and additions such as fruit, berries, paint splatters, succulents and/or flowers can be included too, which makes these confections fully customizable. One of these cakes would be the perfect centerpiece at your wedding reception, especially if you are looking for something modern, edgy and super cool! We are obsessed with this opulent, peachy cake by the talents at Kalabasa. We get lost in the soft color scheme and the abundance of brush stokes…so lovely and decadent! We imagine it tastes of buttercream, vanilla and melon. This beautiful brushstroke cake is embellished with lots of floral prettiness, AND, it has its own little precious brushstroke cake babies! Awwww! Brush strokes gone glam! This show-stopping, jaw-dropping cake by crustncakes.com features large metallic brush strokes and cascading figs. This one delivers some major style! How charming is this playful pink flamingo cake by Cayla of pankobunny? She is the queen of edible cuteness! This would be so adorable for a wedding shower or a Florida themed wedding! Or for anyone in need of a dose of cheerfulness! Now that we’re thinking about this, wouldn’t a white swan brush stroke cake be PERFECT, too, for a wedding? Want to try your hand at making a beautiful brush stroke cake for yourself? Check out this great tutorial by self-taught pastry chef Erin Gardner on TheCakeBlog.com.